Please do not expect too much too soon! Remember that healing times vary with the type and position of the piercing, and can vary significantly from person to person depending upon a variety of factors such as lifestyle, movement and your overall health. Please visit: www.holier-than-thou.co.uk/services/piercing/piercing-healing-times to learn how long your piercing will take to heal and bear in mind for some piercings like cartilage or surface piercings it can commonly take a year or more for it to heal! Please do not remove or replace the initial piercing jewellery until it is fully healed. Please try to ensure a piece of jewellery is worn in the piercing for at least 12 months after it has healed, if jewellery needs to be removed for any reason, it is advisable to wear a retainer to ensure your piercing does not close up. Soon after the piercing, it may bleed if knocked. This is common and perfectly normal! Just apply some sterile gauze and pressure for a couple of minutes until the blood clots. For the first few weeks, expect the area to be red, swollen, tender, puffy & sometimes bruised. Expect the piercing to bleed on and off and secrete a sticky clear/white/pale yellow fluid throughout the healing process. This may form a crust once its dried. Many people mistake this fluid as a sign of infection – please don’t worry, its usually lymph which is completely normal and is a healthy part of the healing process. A green smelly fluid indicates infection. 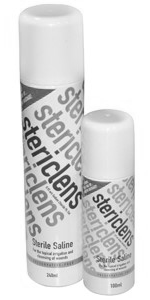 Clean your piercing twice daily using either Stericlens or H2Ocean or a single use sterile saline pod. Make sure your hands are clean before cleaning your piercing! Spray the solution onto a piece of clean lint free kitchen roll and ‘soak’ the piercing for a couple of minutes. Then use a clean cotton bud dipped in the solution to remove any ‘crusty’ bits of secretion that should now be nice and soft thanks to the soak. Pat dry with clean kitchen roll following cleaning. When cleaning, ensure any balls or attachments on your jewellery are tightened as they can come loose easily due to the natural movement of the area. You want a 0.9% sterile saline solution to clean your piercing with. It should be Sterilised, pre-mixed, and have a sterile delivery method like a can spray that ensures bacteria cannot enter the can once opened. We recommend Stericlens or H2Ocean. You can purchase this from us in the studio or online. 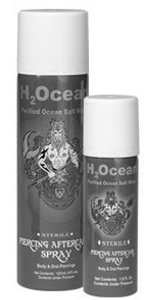 The only difference between the two is that H2Ocean is thought to slightly encourage healing as it is made from purified salt water (maintaining all the minerals of sea salt) and contains an enzyme called Lysozyme, which is naturally found within our mucosal membranes, this kills bacteria. However, the Lysozyme is made from eggs, therefore H2Ocean is not Vegan, if this concerns you then Stericlens may be a better alternative. DO NOT USE Antiseptic preparations such as Savlon cream or spray, TCP, Hydrogen Peroxide, Lavender oil, Tea tree oil, Dettol, Surgical Spirit etc – DO NOT USE THESE to clean your piercing! These are very harsh and will cause irritation and delay healing. DO NOT USE contact lens solution or similar to clean your piercing – these contain preservatives and chemicals not suitable for the skin. DO NOT USE any bottled re-sealable piercing solutions like those from Claires Accessories or online. Despite the fact that these are marketed as a piercing aftercare solution, they often contain nasty preservatives and do not have a sterile delivery method – this means that once opened they carry a high risk of causing infection due to growth of Pseudomona aeruginosa or Notuberculosis Mycobacteria (NTM). The only way to protect yourself against this is to buy a sterilised product, with a sterile delivery method such as H2Ocean or Stericlens. Whilst it is possible to mix up your own saline solution, we no longer recommend you do so, because it is difficult to make this up in a hygienic environment at home, and people sometimes accidentally use the incorrect type of salt. People have also struggled to mix up salt and water in the correct ratio – If a saline solution is mixed up too strong, it dries out the skin and can cause lots of issues during healing such as fluid bumps (which, if untreated, can lead to hypertrophic scarring), and if it is mixed up too weakly, there isn’t enough salt in the solution which can lead to increased risk of infection. If you really insist on mixing up your own saltwater solution, be sure to use exactly half a pint (285ml) of boiling water and add exactly a quarter of a teaspoon of rock or sea salt (NOT table salt) and be sure that the container you are mixing it up in is very clean. Allow it to cool slightly before use so you do not burn yourself, and be sure to mix it up fresh each time you clean your piercing. Avoid soap, shampoo, and chemical residues from showering/bathing. Be sure to rinse the piercing with clean water following a shower or a bath. Avoid playing or fiddling with the piercing using dirty fingers. This will likely increase healing time, cause it to swell, and/or cause an infection. Avoid moving or twisting the piercing whilst dry. If any secreted discharge has hardened on the jewellery, turning it may tear the skin, increase scarring and the risk of getting fluid build-ups, it will prolong healing and could leave you more susceptible to infection. Avoid knocking the piercing or causing any trauma – A knock may cause swelling or soreness to flare up again throughout the healing phase. Avoid swimming pools for the first few weeks. Avoid sleeping on your piercing – it will delay healing and can migrate the piercing – causing it to heal ‘wonky’. 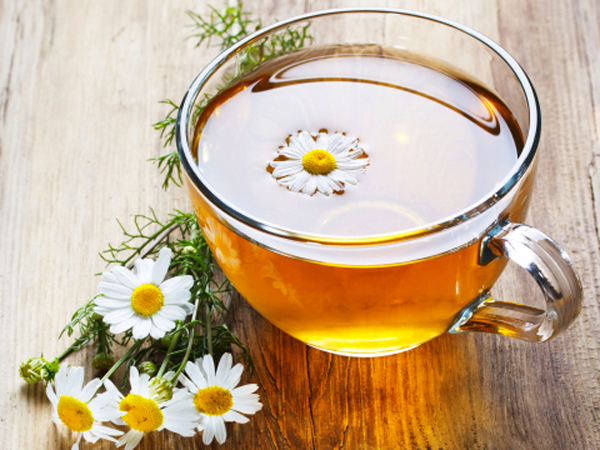 Chamomile is a daisy-like plant that is commonly used to make herb infusions to treat various medical problems or just to enjoy as a herbal tea. Anti cancer effect – chamomile extracts can inhibit growth on cancer cells in the skin, prostate, breast, ovaries and prostate. Anticoagulant effect – Coumarin compounds in chamomile have blood-thinning properties. Anti microbial effect –Chamomile contains compounds including Chamazulene, Alpha-bisabolol, umbeliferone and flavonoids that nave natural antifungal properties. However chamomile also has also been shown to inhibit the growth of the herpes virus and poliovirus and block the aggregation of most strains of E-Coli and other nasties that cause food poisoning such as Helicobacter. Chamomile has also been shown to be effective against bacteria that cause serious skin infection such as Staphylococcus, Streptococcus and Bacillus species. This is wonderful stuff for piercings! Antispasmodic effect – Chamomile contains flavonoids and coumarins which relax muscles. Essentially chamomile can reduce muscle spasms in smooth muscle, and is therefore an effective treatment for diarrhoea and has been shown to be effective at treating colic in children. Central Nervous System effects – Chemical compounds within chamomile can modulate neurotransmission in the brain and which can help calm people and is especially helpful in the treatment of persons with psychiatric disorders, depression, anxiety and schizophrenia. *All of the above information was obtained from this peer-reviewed scientific journal, check it out! Srivastava, JK; Shankar, E; Gupta, S (November 2010). You just want to increase comfort and speed up the healing process! Chamomile soaks will soothe the area and draw out any trapped pollutants such as perfume or hairspray or everyday dust etc. It also opens up tiny blood vessels surrounding the piercing and helps fluid drain, feeling all together more comfortable. Obtain some pure chamomile tea bags (make sure there is no real tea or caffeine in the teabags), steep a teabag in boiling water for a few minutes then fish it out and let it cool ever so slightly just to a point where you do not burn yourself, but you still want it to be as hot as you can stand. Wrap it around the piercing and hold it there under gentle compress until the teabag has gone stone cold. Repeat. Do this instead of one of your daily cleans. If you have a fluid build up, be disciplined with daily chamomile hot compresses and within a few weeks the fluid build-up should have gone. Note it may look worse before it looks better as the fluid starts to drain it may look like a spot – do not pick it else you will increase scarring and delay healing – it will drain of its own accord and the compress will increase the speed in which the fluid will drain. If you have ANY concerns, questions or queries PLEASE get in touch. If you are ever in any doubt in regards to your piercing (regardless of where it was done or what advice you have been given) please pop in and see us! We will always help as much as we can.